The Allied Expeditionary Force (AEF) Trenches exhibit is a general representation of several of the types of trenches American Soldiers encountered during their time in Europe during World War I. As you walk through the trench, many of the features of the defensive fortification are on display to present the daily experiences of Doughboys during the war. Some of the important sections of a large trench network are portrayed, such as an aid station, a headquarters, a mortar pit, and the deadly front lines. In front of the exhibit is No-Man's Land, complete with barbed-wire entanglements and pocked with artillery craters. In addition, signboards throughout the exhibit share the experiences of an AEF Soldier, Private Donald D. Kyler of Company G, 16th Infantry Regiment, 1st Infantry Division. Sections of his memoir accent gritty photography taken at the front during the battles in Western Europe. The Great War of 1914 ground to a halt over the course of dreary, blood soaked years. European armies found themselves in a frustrating stalemate in the muddy trenches of France, Belgium, and Eastern Europe. On the Western Front, Germany, Austria, and Hungary faced down the Allies, France and Britain over barbed-wired No-Man's Land running north to south over nearly the entire continent. 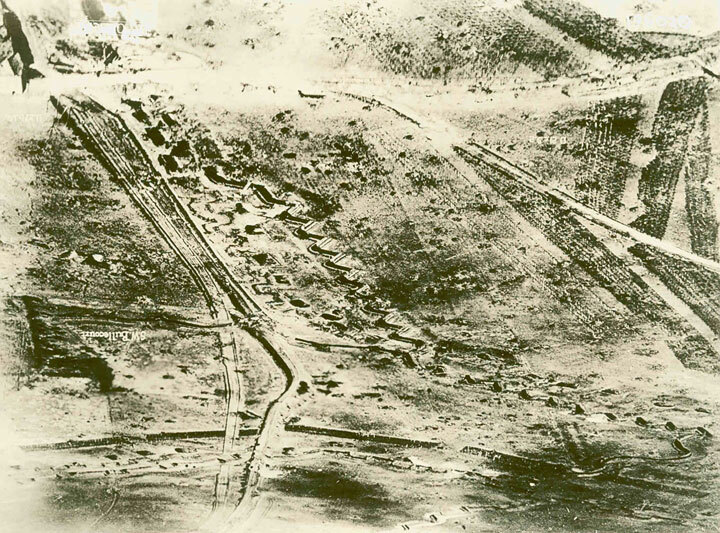 The primary feature of the wasteland over which the massive armies fought was the ubiquitous trench, an aspect of war hundreds of years in development. The trench, combined with new and powerful weapons of war, served to arrest movement and maneuver, forcing both sides to take cover deep inside their subterranean defenses. Such was the environment the green American troops entered in 1917 as they filtered into Europe to assist the Allies in pushing Germany out of France. 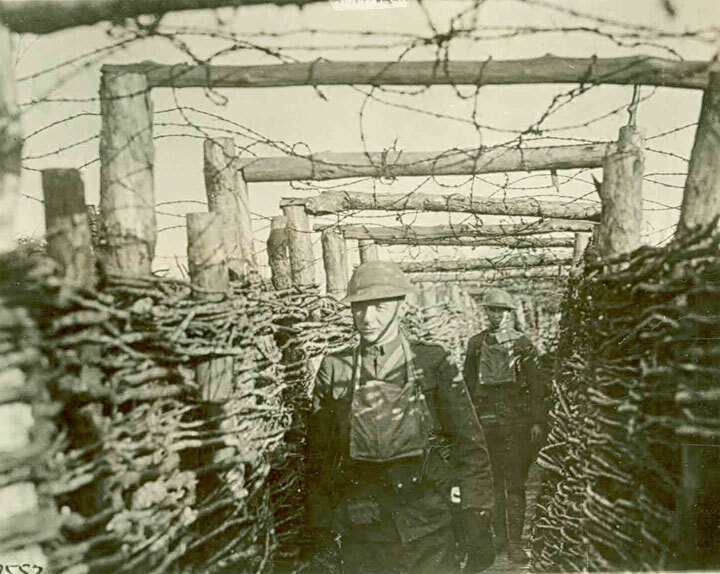 The trenches crisscrossing Western Europe during World War I were not a new invention. Trench warfare was already in heavy use during the American Civil War, half a century before. World War I, however, brought the trench to maturity. When the deep hardened trench works combined with machine guns and increasingly efficient and deadly artillery, the only real fighting became devastating rushes and attacks by waves of Soldiers who either ended up slaughtered or only in possession of a few more yards of territory. Trench warfare was not in the original plans of the military powers prior to hostilities in 1914. Instead, the generals planned on a short, decisive war that would "be over by Christmas." The generals were sorely mistaken; Soldiers on the front lines during the first years of fighting found themselves facing machine guns and artillery that made offensive maneuver practically impossible. The tactical answer to these weapons was to use farm ditches and shell craters to take hasty positions of safety against the onslaught of lead and steel. Captured German Trench Click Picture for More Time and brutal fighting transformed the field-expedient positions into refined trench systems. Soon both sides had trenches running parallel to each other. The induction centers themselves represented a significant accomplishment of planning and engineering. The Army used empty land in strategic locations all over the country to erect, in some cases in only a few short weeks, training facilities built of plywood, tar paper, and clap boards. Mess halls, vehicle garages, and barracks sprang up from nowhere, ready to accept the recruits and turn them into Soldiers The rudimentary buildings, built in a "modular" design, could be used for any purpose from sleeping quarters to training rooms. In addition, the simple constructions broke down easily and shipped anywhere, even to the United Kingdom or islands in the Pacific. By the time the Americans entered the war, the trenches had been in use for years. 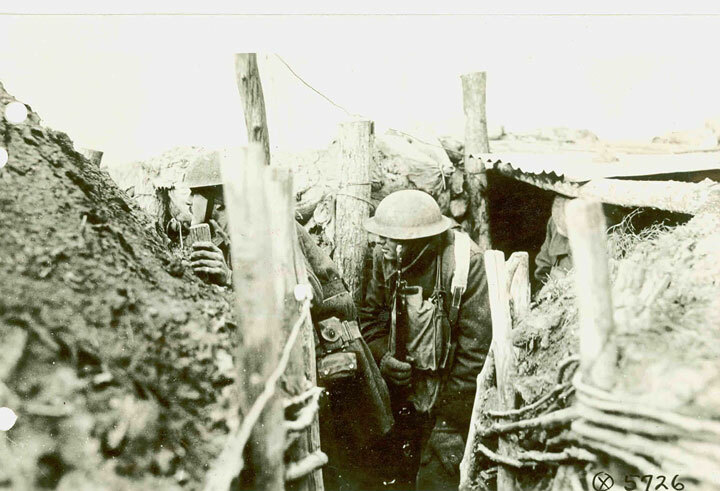 The major features of the trenches were based around minimizing casualties from artillery bombardment and enemy raids. 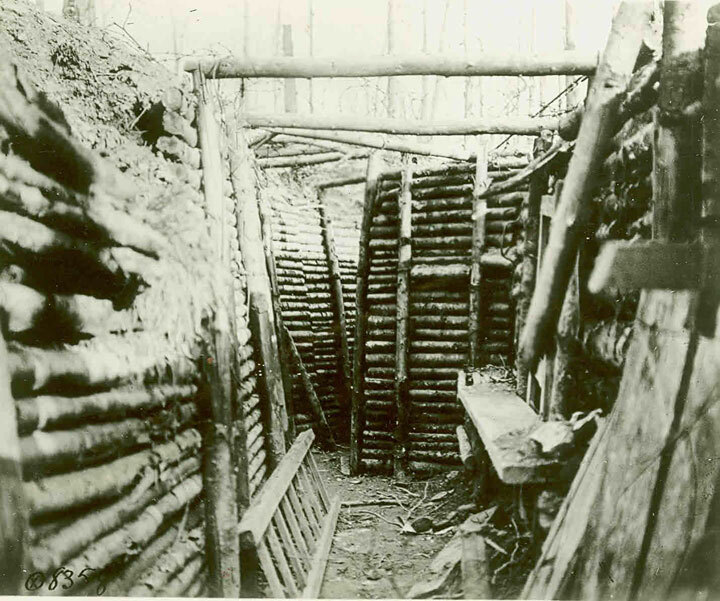 The trenches were built in a zig-zag pattern to keep raiding enemies from firing down the full length of the fortification. In the most developed trenches, dugouts for sleeping and protection from artillery, concrete reinforcement, and blind alleys for confusing penetrating enemies were common. The floors of the trenches were either mud and muck or, for the lucky Soldiers, made of wooden planks called "duckboards." The trenches were, of course, for defense. Sections of trench line had machine gun emplacements set to cover any advances by the enemy, while other areas had specially camouflaged positions for snipers to hide in, taking aim at any Soldier who might stick his head up at the wrong time. Mortar pits, aid stations, and simple firing positions for riflemen dotted the front line, ready for the next fight. Connecting all of these positions to the command and control elements in the rear was another set of trenches in which Soldiers could move back and forth from the front lines in relative safety. Even behind the front, all movement outside the trench was dangerous due to the great range of enemy artillery. Riflemen and machine gun crews faced the enemy trenches over a desolation known as "No-Man's Land." Each side placed increasingly complicated networks of barbed wired in front of their trench lines to slow down and stop advancing troops. In addition, batteries of artillery were registered specifically to pound No-Man's Land with massive barrages of shells should any attack be launched. 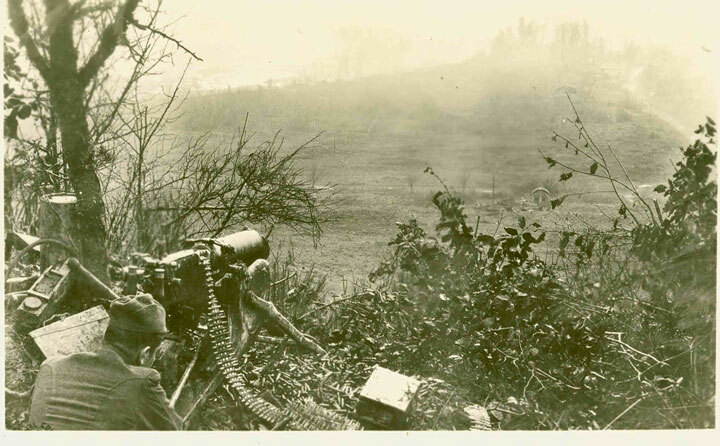 Finally, the machine gun positions were ready to mow down any troops who made it past the artillery and barbed wire. The awful result of many failed attempts on this trifecta of murderous defense was the constant stench of dead and rotting enemy corpses floating into the trenches from the No-Man's Land. The trench fortifications in Western Europe were by far the most visible geographical feature of the war. They were built in the first place because of the weapons systems developed before and during the war. The advent of machine guns, used in the tactical manner of the day, precipitated their primary position as a defensive weapon. Their extreme rate of fire and general mechanical reliability made them the primary force to be dealt with during any engagement, and were nearly impossible to attack against in an open field of battle. Artillery, the king of battle since the invention of gunpowder, also reached new levels of effectiveness. Artillerymen had made an art out of the mathematics and engineering required to fire effective and deadly strikes against enemies, forcing the other side to dig in. It was common for batteries of artillery to fire millions of shells over the course of days at the enemy trenches to "soften the defenses" in preparation for an attack. The shells served to destroy the targeted trenches, force the enemy Soldiers into their dugouts and shelters, and cut the tangles of wire in front of their defenses. Machine guns and artillery were combined with poison gas attacks, sniper posts, and countless other horrors to make the Soldier's experience in the trenches utterly miserable. The Americans entered the trench environment in 1917 with very little understanding of what awaited them. The Doughboys arrived in the front line trenches with French arms and untried commanders, but quickly became a premier fighting force. The addition of the American troops broke the stalemate and pushed the Germans back into Germany, forcing them into the armistice that ended the devastation of the First World War. Information about the American experience in World War I is available in countless biographies, autobiographies, and researched books available at any public library. The collections at the U.S. Army Heritage and Education Center feature the World War I veterans surveys and the unpublished memoirs and papers of many of our brave Soldiers who fought, and died, in the Great War. A sophisticated German trench captured in March, 1916, near Baddonviller, France. Americans from the 166th Infantry moving through Allied trenches near Blemiercy. A German machine gun outpost overlooking no mans land. American Doughboys on a lookout post in the Ansauville Sector trenches. American Soldiers of the 1st Infantry Division leaving the trenches to attack Cantigny. 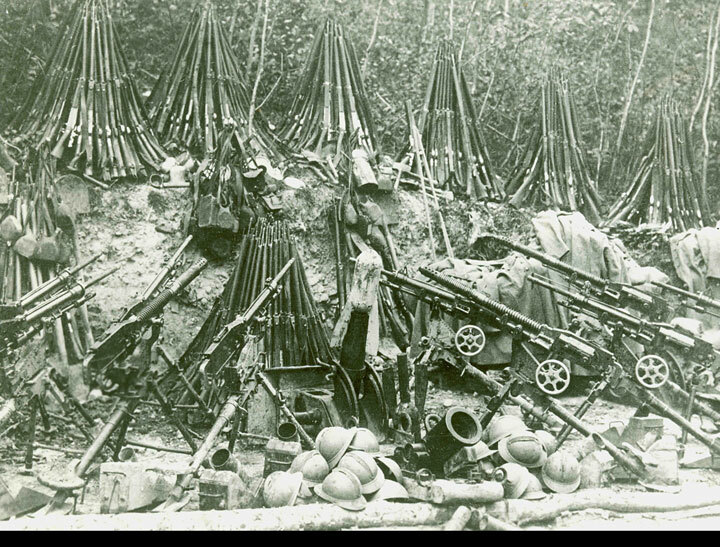 French Materiel captured by the Germans in 1915 on the Argonne front. 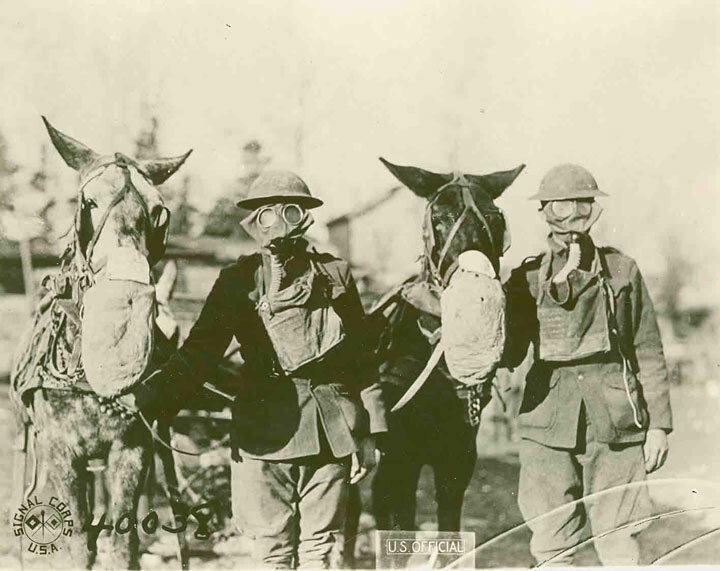 Gas attacks were increasingly common as the war drug on. Soldiers were not the only ones who needed protection! 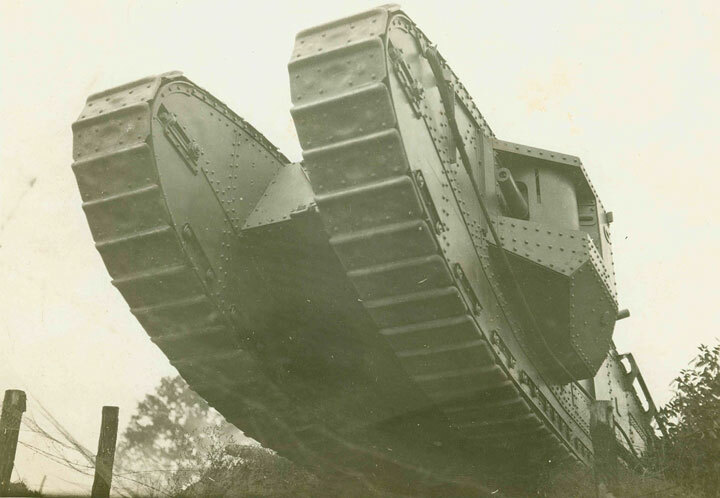 Near the end of the war, the first effective tanks helped to break the stalemate.